Didier Yves Drogba Tébily (French pronunciation: ​[didje dʁɔɡba]; born 11 March 1978) is an Ivorian retired professional footballer who played as a striker. He is the all-time top scorer and former captain of the Ivory Coast national team. He is best known for his career at Chelsea, for whom he has scored more goals than any other foreign player and is currently the club's fourth highest goal scorer of all time. He was named African Footballer of the Year twice, winning the accolade in 2006 and 2009. In July 2004, Drogba moved to Premier League club Chelsea for a club record £24 million fee, making him the most expensive Ivorian player in history. In his debut season he helped the club win their first league title in 50 years, and a year later he won another Premier League title. His displays saw him named in the FIFA World XI for 2007. In March 2012, he became the first African player to score 100 Premier League goals. Just two months later, he scored in Chelsea's 2012 FA Cup Final win over Liverpool to become the first (and as of 2017[update], the only) player to score in four separate FA Cup finals. He also played in the 2012 UEFA Champions League Final, in which he scored an 88th-minute equaliser and the winning penalty in the deciding shoot-out against Bayern Munich. After spending 6 months with Shanghai Shenhua in China, and one and a half seasons with Turkish club Galatasaray where he scored the winning goal in the final of the 2013 Turkish Super Cup, Drogba returned to Chelsea in July 2014. With a career record of scoring 10 goals in 10 finals winning 10 trophies at club level, Drogba has been referred to as the "ultimate big game player." He joined Canadian club Montreal Impact in 2015 as a Designated Player and played 41 matches over two seasons, scoring 23 goals. Drogba became a player–owner for Phoenix Rising of the United Soccer League in 2017, and retired a year later at the age of 40. An Ivory Coast international between 2002 and 2014, Drogba captained the national team from 2006 until his retirement from the Ivory Coast team and is the nation's all-time top goalscorer with 65 goals from 104 appearances. He led the Ivory Coast to the 2006 FIFA World Cup, their first appearance in the tournament, and also scored their first goal. He later captained the Ivory Coast at the 2010 and 2014 FIFA World Cups. He was part of the Ivory Coast teams that reached the final of the Africa Cup of Nations in 2006 and 2012, but were beaten on penalties on both occasions. On 8 August 2014, he announced his retirement from international football. In 2018, Drogba retired from professional football at the age of 40. Afterwards, on 11 December, he became Vice President of the international organization Peace and Sport. The 2007–08 season began badly for Drogba as he expressed his doubts about the departure of manager José Mourinho. He was reportedly in tears when Mourinho told him he was leaving the club, and said "Mourinho's departure destroys a certain familiarity we had at the club. Many of us used to play first and foremost for the manager. Now we need to forget those feelings and find another source of motivation". Following these claims, Drogba told France Football Magazine "I want to leave Chelsea. Something is broken with Chelsea, The damage is big in the dressing room". 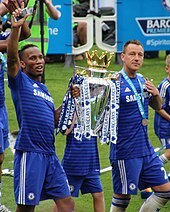 Despite having signed a four-year contract with the club in 2006, Drogba reportedly pointed out several favoured clubs in the interview, identifying Barcelona, Real Madrid, Milan or Internazionale as possible future destinations, he later admitted he regretted this and was 100% committed to Chelsea. Drogba made it up to the fans by scoring in Chelsea's 2–0 victory over Middlesbrough on 20 October 2007, against Schalke 04 in the Champions League four days later, and two goals against Manchester City. 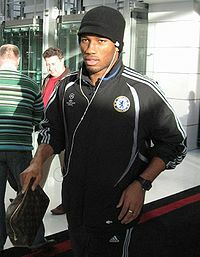 In December 2007, Drogba was voted fourth (after Kaká, Lionel Messi and Cristiano Ronaldo) for the 2007 FIFA World Player of the Year. Drogba began the 2009–10 season in fine form for Chelsea, netting a penalty during a shoot-out win in the Community Shield over Manchester United, before scoring twice in a 2–1 victory over Hull City. Drogba earned himself an assist when he was fouled in the penalty box to give Chelsea a penalty, which Frank Lampard converted, in a 3–1 victory over Sunderland. In Chelsea's third game of the season against West-London rivals Fulham, Drogba scored his third goal of the season. Drogba scored his fourth goal of the season, against Stoke City; Chelsea ended winning the game 2–1 with a late strike from Malouda. He added a fifth at home against London rivals Tottenham Hotspur on 20 September. He scored his 100th goal for Chelsea in a 3–1 defeat against Wigan Athletic. Drogba was again important in the 2–0 win over title rivals Liverpool on 4 October. He assisted both goals, setting up Nicolas Anelka and Florent Malouda. He then scored a glancing header against Blackburn on 24 October 2009, bringing his tally to eight goals in eleven appearances, scoring his third goal in as many games. 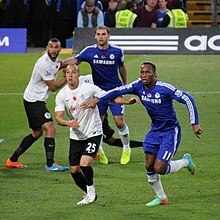 Drogba continued his fine form scoring a header against Bolton Wanderers in a 4–0 win in the League Cup, Drogba went on to score a goal in the same week with another 4–0 win against Bolton Wanderers in the Premier League. After missing the first three Champions League matches for Chelsea with a ban for being unsportsmanlike, Drogba started the fourth game against Spanish side Atlético Madrid. He scored two goals in the last ten minutes and the match ended 2–2. 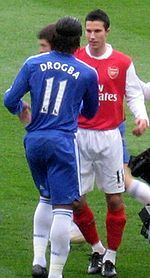 On 29 November, Drogba scored a goal against London rivals Arsenal at the Emirates Stadium, the second of which a free kick from outside the box. It brought his tally for the season to 14 goals in 16 games. On 12 December, Drogba continued his performance with two goals in 3–3 draw against Everton. Between 3 and 30 January Drogba was on Africa Cup of Nations duty and came back on 2 February against Hull City where he scored a 40th-minute equaliser to tie the game 1–1. On 24 March, Drogba scored his 30th goal of the season in an away game against Portsmouth. On 9 May, Drogba helped Chelsea to win the Premier League by scoring a hat-trick in an 8–0 win over Wigan Athletic. In doing so, he not only collected his third League winner's medal but also won the Golden Boot for the season, his second time doing so, by topping the chart with 29 league goals, beating Wayne Rooney to the title who remained on 26 goals. Both players had the same number of goals (26) before the start of their respective matches. However, during the game, Drogba appeared to be clearly angry with teammate and regular penalty taker Frank Lampard, after Lampard refused to let Drogba take a penalty which would lead Chelsea to go 2–0 up and give him a chance of winning the golden boot. Lampard scored the penalty, but Drogba did not celebrate with his teammates. Later on in the game though Ashley Cole was tripped in the box when Chelsea were already 5–0 up, and this time Lampard allowed Drogba to take the penalty, which he scored to go two goals clear of Rooney. Drogba came on as a substitute for Anelka against Manchester United in the Community Shield, but could not help prevent Chelsea from succumbing to a 3–1 loss. However, he started the Premier League season in fine form, continuing from where he left off on the last day of the previous campaign as he scored a hat-trick against West Bromwich Albion in a 6–0 victory. In Chelsea's next game against Wigan Athletic at the DW Stadium, Drogba made three assists in another 6–0 win. Drogba played the next game at home against Stoke City where he lasted the whole 90 minutes and scored his fourth Premier League goal of the season when he kicked home a penalty after Nicolas Anelka was brought down by Thomas Sørensen inside the box. On 7 November 2010, Drogba missed the first half of Chelsea's 2–0 defeat by Liverpool at Anfield. It was later revealed that he had been suffering from malaria for at least a month. He had first complained of feeling unwell before the October 2010 international break but the illness was only diagnosed on 8 November 2010. Having diagnosed the problem, Chelsea insisted that he would make a full recovery within days. Drogba scored his seventh goal at Wembley Stadium against London rivals Tottenham Hotspur on 15 April, blasting the ball past former teammate Carlo Cudicini as Chelsea became 5–1 winners and secured a place in the FA Cup Final against Liverpool. Three days later, he scored a vital goal as Chelsea beat Barcelona 1–0 at Stamford Bridge in the first leg of their UEFA Champions League Semi-final clash. Drogba became the first player to score in four different FA Cup Finals, as he netted the winner in Chelsea's 2–1 triumph over Liverpool on 5 May. Drogba also holds the record for most goals scored at the new Wembley Stadium with eight. 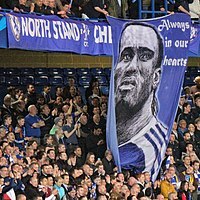 On 22 May 2012, Chelsea released a note on their official website announcing that Drogba would leave the club when his contract expired at the end of June 2012. 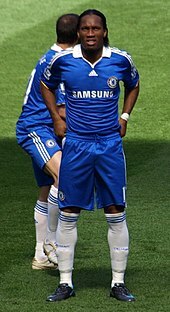 On 19 June 2012, Drogba declared he would be joining Chinese Super League side Shanghai Shenhua, linking up with his former Chelsea teammate Nicolas Anelka. It was reported that he signed a two-and-a-half-year deal where he will earn £200,000 a week. 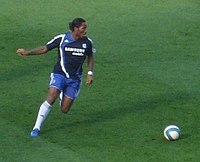 On 22 July, Drogba made his debut for Shanghai Shenhua in a 1–1 away draw against Guangzhou R&F, coming on as a substitute for Brazilian defender Moisés in the second half. He assisted Cao Yunding's equaliser in the 67th minute. On 4 August, he scored his first two goals in a 5–1 win against Hangzhou Greentown. He scored two more goals on 25 August, both set up by Anelka, as Shenhua drew 3–3 with Shandong Luneng. On 28 January 2013, Drogba agreed to a one-and-a-half-year deal with Süper Lig team Galatasaray. He would earn a sign-on fee of €4 million plus basic wage of €4 million per season, €2 million for the remaining 2012–13 Süper Lig and €15,000 per match. However, on 30 January 2013, Shenhua released a press release that Drogba would unilaterally breach his contract if he were to join Galatasaray. Drogba playing in the UEFA Champions League last 16 for Galatasaray in March 2014. On 15 February, Drogba scored his debut goal for Galatasaray just five minutes after coming off the bench against Akhisar Belediyespor in a match that ended 2–1. On 9 April, Drogba scored his first goal for Galatasaray in the Champions League, against Real Madrid. 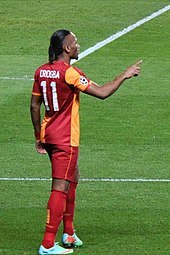 On 20 April, Drogba scored twice in a match against Elazigspor that ended 3–1. He won his first title with Galatasaray on 5 May, with a 4–2 win over Sivasspor. In Galatasary's derby match against Istanbul rivals Fenerbahçe on 12 May, Drogba and his Ivorian teammate Emmanuel Eboue were subjects of racist chants from opposing fans in the team's 2–1 loss, but no fine or bans were handed down to the supporters or the club. On 11 August, he scored the only goal in the 2013 Turkish Super Cup against the same opponents, and he scored two second-half goals in a 2–1 away win against fellow city rivals Beşiktaş on 22 September, although the match was abandoned due to hooliganism from fans of the opponents. It was an easy decision. I couldn't turn down the opportunity to work with José Mourinho again. Everyone knows the special relationship I have with this club and it has always felt like home to me. Mourinho also commented on the transfer, saying: "He's coming because he's one of the best strikers in Europe. I know his personality very well and I know if he comes back he's not protected by history or what he's done for this club previously. He is coming with the mentality to make more history." On 28 July 2014, Chelsea announced that Drogba would wear the number 15 shirt which he wore when he first signed for the club in 2004. Mohamed Salah, who wore the number during the 2013–14 season, took over the number 17 shirt vacated by Eden Hazard. On 15 August, however, it was announced that Drogba had been given back the number 11 shirt he previously wore at the club, with its previous occupant Oscar taking over the number 8 jersey vacated by Frank Lampard. During the MLS offseason, recently appointed Chelsea manager Guus Hiddink revealed interest in bringing on Drogba in a short-term coaching capacity after Drogba made a visit to Stamford Bridge to watch a Chelsea match with Hiddink and owner Roman Abramovich. Montreal then reiterated their intent for Drogba to finish his contract with the club, but were left uncertain until Drogba publicly confirmed his intent to play with Montreal for the 2016 MLS season on 3 March 2016. After beginning his preseason training in Qatar away from the club, Drogba joined the Impact for the second half of their preseason training in St. Petersburg, Florida. On 3 March, club technical director Adam Braz announced that Drogba would not play matches on artificial turf to begin the season due to possible implications on his knee. In July 2016, Drogba was included in the roster for the 2016 MLS All-Star Game, scoring in a 2–1 defeat to Arsenal on 28 July. 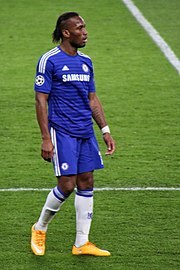 On 14 October, following his exclusion from the starting lineup of a match against Toronto FC by manager Mauro Biello, Drogba refused to play for the team that night, removing his name from the squad. With both his fitness, due to a lingering back injury, and his role in the team in question, Drogba did not travel with the team to, although he was in attendance at, their first postseason match at D.C. United, a 4–2 victory on 27 October. Drogba did not nearly experience the same level of success in his second regular season compared to the first, scoring only 10 goals while appearing in only 22 games. On 12 April 2017, after nearly four months as a free agent and declining a move to Corinthians, Drogba signed for USL side Phoenix Rising FC. He also became an owner of the club, making him the very first player-owner in football history. He made his debut for the club on 10 June 2017, and scored a goal and an assist, leading the team to a 2–1 victory over Vancouver Whitecaps FC 2. In July 2017 Drogba attracted attention after scoring an impressive last-minute free kick in a game against Orange County to tie the game. On 7 August, he scored with a powerful 40-yard free kick against LA Galaxy reserve side which was followed by his classic knee-slide goal celebration in front of the bench. In November 2018, at the age of 40, Drogba scored against Orange County as Phoenix won the USL Western Conference. On 8 November, Phoenix lost the USL Championship game 1–0 at Louisville City FC. Drogba retired later that month at the age of 40, but remained with his final club to work on their bid to join MLS. Given his relatively late breakthrough into professional football, Drogba has often been described as a late bloomer, having signed his first professional contract with Le Mans at the age of 21. He was noted for his physical strength, speed, ability in the air, powerful and accurate strikes, and his ability to retain possession of the ball. Richard Beech of the Daily Mirror says that his "powerful and intrusive approach made him the lone striker [José] Mourinho grew to admire, and made it nearly impossible for opposing teams to isolate him and freeze him out of the game." Drogba in 2011 with Chelsea. He wore the number 11 jersey for most of his club and international career. Drogba is renowned for performing in big games, with a goalscoring record at club level of 10 goals in 10 finals winning 10 trophies. Aside from his goalscoring ability, Drogba is also capable of providing assists to his teammates. Between the 2009–10 and 2011–12 seasons, he managed 24 assists in the Premier League, with an average pass success rate of 61.4 percent, owing to his vision and creativity on the ball. He provided 71 assists to teammates over the course of his entire career at Chelsea until May 2012, showing that he is also a team player. Drogba is often ranked one of the top three greatest African strikers, with George Weah (left) and Samuel Eto'o (right). In set pieces, Drogba has also been known for his free kick ability, known to strike the ball with power and pace. Dr. Ken Bray of University of Bath has described him as a specialist especially from central positions, and says that he "really just passes the ball very hard". He adds, "He hits it [the ball] very straight and appears to hit the ball with a very powerful side-foot action, almost like the technique used in a side-foot pass. Drogba's style is about beating the goalkeeper with speed and depth." Drogba's trademark goal celebration saw him slide on his knees accompanied with an arm pump and a salute to fans – his celebration appears in EA Sports' FIFA video game. One of the greatest African players ever, Drogba is usually ranked among the three greatest African strikers, alongside George Weah and Samuel Eto'o. Drogba's diverse and robust playing style has seen him frequently cited as the toughest striker numerous defenders have had to face, these include Gerard Piqué, Carles Puyol, Chris Smalling, Nemanja Vidić, and Laurent Koscielny. Drogba is married to Diakité Lalla, a Malian woman whom he met in Paris, and the couple have three children together. His eldest son, Isaac, was born in France in 1999, but grew up in England and has played in the Chelsea academy system. Isaac Drogba signed for French club Guingamp in February 2018. Drogba has two younger brothers who are also footballers: Joël and Freddy Drogba. Freddy, (born 1992), is currently in the youth system of French Ligue 1 side Dijon. He is a devout Roman Catholic. His uncle, Michel Goba, is also a professional footballer and Ivorian international, and his cousin Kévin Goba (Michel's son) is a professional footballer who played in the lower leagues of France. Drogba is credited with playing a vital role in bringing peace to his country. After the Ivory Coast qualified for the 2006 World Cup, Drogba made a desperate plea to the combatants, asking them to lay down their arms, a plea which was answered with a cease fire after five years of civil war. Drogba later helped move an African Cup of Nations qualifier to the rebel stronghold of Bouake; a move that helped confirm the peace process. On 24 January 2007, Drogba was appointed by the United Nations Development Programme (UNDP) as a Goodwill Ambassador. The UNDP were impressed with his previous charity work and believed that his high-profile would help raise awareness on African issues. In September 2011, Drogba joined the Truth, Reconciliation and Dialogue Commission as a representative to help return peace to his home nation. His involvement in the peace process led to Time magazine naming Drogba one of the world's 100 most influential people for 2010. Drogba's charity work continued when, in late 2009, he announced he would be donating the £3 million signing on fee for his endorsement of Pepsi for the construction of a hospital in his hometown of Abidjan. This work was done through Drogba's recently created "Didier Drogba Foundation" and Chelsea announced they too would donate the fee for the deal toward the Foundation's project. Drogba decided on building the hospital after a recent trip to the Ivorian capital's other hospitals, saying "... I decided the Foundation's first project should be to build and fund a hospital giving people basic healthcare and a chance just to stay alive." The same year, Drogba teamed up with sportswear company Nike (whom he is sponsored by) and U2 frontman Bono on the eve of World AIDS Day to fight AIDS, Tuberculosis and Malaria. Drogba said, "It’s a big honour and pleasure for me to be linked with Bono and try to help him save some lives. AIDS and HIV is something that really destroyed Africa, and people don’t really realise how easy it is to save lives — only two pills a day, which is 40 cents." In November 2014, Drogba appeared in FIFA's "11 against Ebola" campaign with a selection of top football players from around the world, including Cristiano Ronaldo, Neymar, Gareth Bale and Xavi. Under the slogan "Together, we can beat Ebola", FIFA's campaign was done in conjunction with the Confederation of African Football and health experts, with the players holding up eleven messages to raise awareness of the disease and ways to combat it. On 22 February 2018, Drogba, former AC Milan striker and current Liberia President George Weah, and teenage French prodigy Kylian Mbappé had a meeting with French President Emmanuel Macron and FIFA President Gianni Infantino at the Élysée Palace in Paris that focused on a sports development project in Africa. As a UNDP Goodwill Ambassador, Drogba has taken part in the annual Match Against Poverty alongside Ronaldo and Zinedine Zidane. He has appeared in the 2012 and 2015 games. Levallois Sporting Club, the amateur club where Drogba began his career, used their percentage of his transfer fees including £600,000 out of the £24 million paid when he joined Chelsea – first to ensure the club's survival, and then to improve their stadium to incorporate modern sports facilities for the benefit of the local community. They renamed the new stadium Stade Didier Drogba in his honour. Updated to games played 9 November 2018. ^ a b c "Didier Yves Drogba Tébily – Goals in International Matches". Rec.Sports.Soccer Statistics Foundation. Retrieved 3 February 2014. ^ "Montreal Impact profile". Montreal Impact. Archived from the original on 9 January 2016. Retrieved 25 October 2015. ^ a b c d e "11 Didier DROGBA". FIFA.com. Archived from the original on 17 July 2014. Retrieved 1 March 2016. ^ a b c "Didier Drogba retires with defeat in USL Cup final". Sky Sports. 9 November 2018. Retrieved 9 November 2018. ^ "Drogba dedicates goal landmark to fans". Premier League. Archived from the original on 8 December 2007. Retrieved 27 May 2012. ^ "Didier Drogba will leave Chelsea this summer". BBC Sport. 22 May 2012. Retrieved 27 May 2012. ^ a b "Didier Drogba: Chelsea re-sign club legend on free transfer". BBC Sport. 25 July 2014. Retrieved 25 July 2014. ^ a b "Drogba signs". Chelsea Football Club. 25 July 2014. Retrieved 25 July 2014. ^ a b "Didier Drogba broke another record with his goal against Schalke last night.. here's five more!". EuroSports. Retrieved 24 September 2016. ^ a b "Drogba not the player he was but can still do Chelsea damage – if he really wants to". Four Four Two. 16 March 2015. ^ "Didier Drogba: Chelsea striker announces Ivory Coast retirement". BBC Sport. 8 August 2014. Retrieved 9 August 2014. ^ Baxter, Kevin (4 June 2014). "It's an old World Cup story for Ivory Coast". Los Angeles Times. Retrieved 17 June 2014. ^ a b "Didier Drogba retires from Ivory Coast". ESPN FC. 8 August 2014. Retrieved 30 April 2016. ^ Calendar, Event (13 December 2018). "Didier Drogba named Vice President of Peace and Sport". HelloMonaco. Retrieved 13 December 2018. ^ a b c d e f g "I love England. If only my son wouldn't wear an Arsenal shirt". Observer Sport Monthly. London. 4 February 2007. Archived from the original on 8 December 2007. Retrieved 15 December 2007. ^ "Whose My Tito?". vitalfootball.co.uk. Retrieved 10 October 2009. ^ "Biography: My childhood". didierdrogba.com. Archived from the original on 6 December 2008. Retrieved 27 July 2008. ^ "Didier Yves Drogba Tébily". Retrieved 24 April 2016. ^ a b McCarra, Kevin (25 November 2006). "Rough diamond Drogba adds the polish". The Guardian. London. Retrieved 15 December 2007. ^ a b c Lovejoy, Joe (31 December 2006). "In English football people don't like it sometimes when you tell the truth". The Times. London. Retrieved 15 December 2007. ^ "Biography: Le Mans". didierdrogba.com. Archived from the original on 13 January 2009. Retrieved 23 October 2008. ^ "Biography: Guingamp". didierdrogba.com. Archived from the original on 13 January 2009. Retrieved 23 October 2008. ^ "Mieux connaître Notre Dame de la Garde". Online Massalia (in French). Archived from the original on 16 October 2005. Retrieved 20 May 2007. ^ a b "Drogba factfile". Sky Sports. 22 May 2012. ^ "Didier Drogba will leave Chelsea this summer". BBC Sport. 22 May 2012. Retrieved 9 April 2013. ^ "Drogba faces surgery". BBC Sport. 8 October 2004. ^ "Bolton 0–2 Chelsea". BBC Sport. 30 April 2005. ^ "Didier Drogba No. 11 F". ESPN Soccernet. Retrieved 17 September 2008. ^ Cross, John (27 March 2006). "DROG'S ABUSE". Daily Mirror. Archived from the original on 6 June 2011. Retrieved 27 March 2011. ^ "Drogba admits handball". Manchester Evening News. 25 March 2006. Archived from the original on 15 July 2014. Retrieved 5 July 2014. ^ "Team History". Chelseafc.com. Archived from the original on 23 September 2013. Retrieved 5 July 2014. ^ "Legends of International Football: Didier Drogba". Sportskeeda.com. Archived from the original on 14 June 2012. Retrieved 9 April 2013. ^ "Oscar to wear No.11 shirt at Chelsea after Drogba departure". Goal.com. 6 August 2012. Retrieved 15 August 2014. ^ "Didier Drogba: Chelsea's past winners will help in Premier League run-in". The Guardian. Retrieved 24 April 2016. ^ McNulty, Phil (27 September 2006). "Levski Sofia 1–3 Chelsea". BBC Sport. ^ McKenzie, Andrew (19 May 2007). "Chelsea 1–0 Manchester United". BBC Sport. ^ a b "Didier Drogba has scored nine goals for Chelsea in cup finals". Retrieved 24 April 2016. ^ "Drogba wins African player award". BBC Sport. 1 March 2007. Retrieved 1 March 2007. ^ "Ronaldo secures PFA awards double". BBC Sport. 22 April 2007. Retrieved 13 May 2007. ^ King, Daniel (1 October 2006). "Chelsea's Drogba deal in bungs inquiry". Mail on Sunday. Retrieved 5 July 2014. ^ "Drogba dismayed by Mourinho exit". BBC Sport. 29 September 2007. Retrieved 30 September 2007. 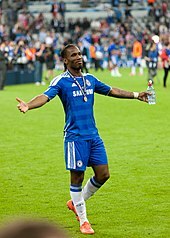 ^ a b "Drogba '100% committed to Blues'". BBC Sport. 23 October 2007. Retrieved 17 September 2008. ^ "Drogba 'wants to leave Chelsea'". BBC Sport. 18 October 2007. Retrieved 18 October 2007. ^ "Chelsea lose Drogba to knee surgery". UEFA.com. 8 December 2007. Retrieved 15 August 2014. ^ "Cautious Chelsea remind QPR of their wealth of on-field talent". The Guardian. 7 January 2008. Retrieved 15 August 2014. ^ "Tottenham 2–1 Chelsea". BBC Sport. 24 February 2008. Retrieved 15 August 2014. ^ "Top Drog bridges gap". Sky Sports. 23 March 2008. Retrieved 15 August 2014. ^ "Chelsea 2–1 Arsenal". The Guardian. 23 March 2008. Retrieved 15 August 2014. ^ Taylor, Daniel (1 December 2006). "Drogba's elbow deserved red card, says Ferguson". The Guardian. London. Retrieved 29 July 2008. ^ Ducker, James (1 December 2006). "Niceties at end as Ferguson sticks boot in over Drogba elbow". Irish Independent. Retrieved 23 October 2008. ^ Haond, Patrick (30 April 2008). "Drogba loses Rafa respect". Sky Sports. Archived from the original on 6 December 2008. Retrieved 23 October 2008. ^ McCarra, Kevin (30 April 2008). "Champions League: Chelsea 3–2 Liverpool (aet, agg: 4–3)". The Guardian. London. ^ "Chelsea striker Drogba keen to break out on his own". Daily Mail. London. 8 April 2008. ^ "Didier Drogba clockwatch". Daily Mail. London. 22 May 2008. ^ McGarry, Ian (22 May 2008). "John Terry should not have taken the penalty". The Sun. London. Archived from the original on 17 October 2012. Retrieved 23 October 2008. ^ Taylor, Louise (3 October 2008). "Relief for Chelsea after scans clear Drogba to return in weeks. He has recently scored three goals in three games in the champions league". The Guardian. London. Retrieved 13 November 2008. ^ "Drogba returns for Chelsea". Sky Sports. 11 November 2008. Retrieved 13 November 2008. ^ "Drogba coin row adds to Chelsea's misery as it crashes out of League Cup". Agence France-Presse. 13 November 2008. Archived from the original on 18 June 2013. Retrieved 13 November 2008. ^ Hytner, David (14 November 2008). "Drogba faces police action and FA ban after coin toss". The Guardian. London. Retrieved 23 January 2009. ^ McCarra, Kevin (9 December 2008). "Drogba delivers Chelsea into last 16 and soothes Scolari's suffering". The Guardian. London. Retrieved 19 December 2008. ^ Williams, Ollie (26 December 2008). "Chelsea 2–0 West Brom". BBC Sport. Retrieved 23 January 2009. ^ "Drogba to fight for Chelsea place". BBC Sport. 22 January 2009. Retrieved 23 January 2009. ^ "Guus Hiddink". Chelseafc.com. Archived from the original on 22 February 2009. Retrieved 9 March 2009. ^ Winters, H. (26 February 2009). "Chelsea striker Didier Drogba repays Guus Hiddink's faith". The Daily Telegraph. London. Archived from the original on 21 December 2013. Retrieved 9 March 2009. ^ "Chelsea 2–1 Arsenal". Sky Sports. Archived from the original on 14 April 2009. Retrieved 18 April 2009. ^ "Drogba given lengthy European ban". BBC Sport. 18 June 2009. Retrieved 17 June 2009. ^ Chris Bevan (30 May 2009). "Chelsea 2–1 Everton". BBC Sport. Retrieved 17 June 2009. ^ "Drogba signs new Chelsea contract". BBC Sport. 6 August 2009. Retrieved 26 February 2010. ^ "Stoke City 1–2 Chelsea". Premier League. 12 September 2009. Archived from the original on 14 July 2014. Retrieved 5 July 2014. ^ "Blues march on with win". Sky Sports. 21 September 2009. Archived from the original on 10 March 2010. Retrieved 11 June 2010. ^ McNulty, Phil (4 October 2009). "Chelsea 2–0 Liverpool". BBC Sport. Retrieved 10 October 2009. ^ "Didier Drogba handed six-game Champions League ban by Uefa". Retrieved 24 April 2016. ^ "Chelsea break records to win title". ESPN. 9 May 2010. Archived from the original on 13 May 2010. Retrieved 10 May 2010. ^ "Chelsea 1 – 0 Portsmouth". Retrieved 24 April 2016. ^ "Video: United lift The Shield – Chelsea FC v Manchester United FC – 08/08/2010". TheFA.com. 8 August 2010. Archived from the original on 27 April 2012. Retrieved 9 April 2013. ^ Fletcher, Paul (14 August 2010). "Chelsea 6 – 0 West Brom". BBC Sport. Retrieved 27 March 2011. ^ Chowdhury, Saj (21 August 2010). "Wigan 0–6 Chelsea". BBC Sport. Retrieved 27 March 2011. ^ "Blues too strong for Stoke". Sky Sports. 28 August 2010. Archived from the original on 1 October 2010. Retrieved 27 March 2011. ^ "Liverpool 2 – 0 Chelsea". BBC. Retrieved 23 August 2018. ^ "Chelsea striker Didier Drogba fit after malaria scare". BBC Sport. 9 November 2010. Retrieved 9 November 2010. ^ Barlow, Matt (9 November 2010). "Didier Drogba has malaria, reveals Carlo Ancelotti ... but Chelsea striker is set to face Fulham". Daily Mail. London. ^ "Chelsea wait for news on concussed striker Didier Drogba". ESPN Soccernet. 27 August 2011. Retrieved 30 April 2016. ^ "Match report: Chelsea 4 Swansea City 1". Chelseafc.com. 24 September 2011. Archived from the original on 4 August 2013. Retrieved 5 July 2014. ^ "Chelsea 4–1 Swansea City". BBC Sport. 24 September 2011. Retrieved 25 April 2015. ^ Wilson, Jeremy (23 October 2011). "Chelsea see Jose Bosingwa and Didier Drogba sent off in defeat to Queens Park Rangers". The Daily Telegraph. London. Retrieved 23 October 2011. ^ "Drogba rejects new deal". ESPN Soccernet. 29 November 2011. Retrieved 30 April 2016. ^ "Chelsea shocked at home by Villa". asia.eurosport.com. 31 December 2011. Retrieved 31 December 2011. ^ Draper, Rob (25 February 2012). "Chelsea 3 Bolton 0: That'll do! Relief for AVB as Luiz, Drogba and Lampard secure win". Daily Mail. London. ^ White, Duncan (10 March 2012). "Chelsea 1 Stoke City 0: match report". The Daily Telegraph. London. ^ "Gamecast: Tottenham Hotspur v Chelsea". ESPN FC. 15 April 2012. Archived from the original on 18 April 2012. Retrieved 9 April 2013. ^ "Chelsea 1–0 Barcelona". BBC Sport. 18 April 2012. Retrieved 18 April 2012. ^ "Which Wembley records could Tottenham break this season?". Sky Sports. Retrieved 20 October 2018. ^ "Drogba fulfils Chelsea dream". Sky Sports. 19 May 2012. Archived from the original on 22 May 2012. ^ Turrell, Rhys (8 July 2012). "Sir Alex Ferguson believes Drogba departure will help Chelsea's rivals". Goal.com. Retrieved 9 April 2013. ^ "Drogba set for talks over new Chelsea deal ... but European champions still won't commit to Di Matteo". Daily Mail. London. 20 May 2012. Retrieved 9 April 2013. ^ "Top Drog: Chelsea fans pick Euro hero Didier as club's greatest ever player". Daily Mirror. 31 October 2012. Retrieved 15 November 2012. ^ "Farewell Didier Drogba". Chelsea F.C. official website. 22 May 2012. Archived from the original on 7 August 2013. Retrieved 5 July 2014. ^ "Didier Drogba will leave Chelsea this summer". BBC Sport. 21 May 2012. Retrieved 22 May 2012. ^ "Drogba completes Shanghai switch". ESPN FC. 20 June 2012. Retrieved 30 April 2016. ^ "Drogba confirms Shanghai move". Sky Sports. 19 June 2012. ^ "Drogba shows class is permanent in Shanghai". Give Me Football. 8 August 2012. ^ "Didier Drogba Join Galatasaray" (in Turkish). Galatasaray.org. 28 January 2013. Archived from the original on 31 January 2013. ^ "Didier Drogba: Galatasaray sign striker from Shanghai Shenhua". BBC Sport. 28 January 2013. Retrieved 29 January 2013. ^ "Didier Drogba-Transfer". Galatasaray (in Turkish). Istanbul Stock Market (IMKB) Public Disclosure Platform (KAP). 28 January 2013. Retrieved 30 April 2016. ^ 申花俱乐部关于德罗巴加盟加拉塔萨雷俱乐部的声明 [Press Release regarding Drogba joins Galatasaray] (in Chinese). Shenhua FC. 30 January 2013. Archived from the original on 2 February 2013. Retrieved 31 January 2013. ^ "Drogba transferinde beklenen haber geldi". Hurriyet Newspaper. Retrieved 12 February 2013. ^ "Drogba'ya lisans çıktı!". Milliyet Newspaper. Retrieved 12 February 2013. ^ "Süper Lig: Didier Drogba'nın lisansı TFF'ye ulaştı". Eurosport. Retrieved 12 February 2013. ^ "Didier Drogba scored on his Galatasaray debut in a 2–1 win at Akhisar Belediye". Sky Sports. 15 February 2013. ^ "Drogba double guides Galatasaray to victory". The Worldgame. 20 April 2013. Archived from the original on 21 June 2013. Retrieved 20 April 2013. ^ "Galatasaray win record 19th Turkish title". BBC Sport. 5 May 2013. Retrieved 7 May 2013. ^ "Galatasaray: Didier Drogba questions racists who abused him". BBC Sport. 14 May 2013. ^ "Galatasaray win TFF Super Cup 2013". Turkish Football Federation. 11 August 2013. Retrieved 1 July 2016. ^ Wood, Dave (23 September 2013). "Drogba forced to flee rioting fans after Galatasaray's derby against Besiktas abandoned in 93rd minute". Daily Mail. Retrieved 1 July 2016. ^ "Drogba takes 15". Chelsea Football Club. 28 July 2014. Retrieved 28 July 2014. ^ "Mohamed Salah changes Chelsea kit number". KingFUT.com. 23 July 2014. Retrieved 15 August 2014. ^ "Squad number changes". Chelsea Football Club. 15 August 2014. Retrieved 15 August 2014. ^ "Didier Drogba takes back his No 11 squad number as Oscar is given the No 8 shirt worn by Chelsea legend Frank Lampard". Mail Online. 15 August 2014. Retrieved 15 August 2014. ^ "Fixture – Burnley vs Chelsea". Premier League. 18 August 2014. Archived from the original on 12 November 2014. Retrieved 18 August 2014. ^ "Chelsea 1–1 Schalke". BBC Sport. 17 September 2014. Retrieved 17 September 2014. ^ "Didier Drogba scored his first goal since rejoining Chelsea as they recorded their biggest Champions League win with a dominant victory against Maribor at Stamford Bridge". BBC Sport. 21 October 2014. Retrieved 21 October 2014. ^ McNulty, Phil (26 October 2014). "Man Utd 1–1 Chelsea". BBC Sport. Retrieved 26 October 2014. ^ "Didier Drogba carried off by Chelsea team-mates as he is substituted during final game". Mail Online. 24 May 2015. ^ "Drogba: Today's my final Chelsea game". Chelsea F.C. 24 May 2015. Retrieved 24 May 2015. ^ "Didier Drogba joins MLS side Montreal Impact". BBC Sport. 27 July 2015. ^ "Montreal Impact confirms signing ex-Chelsea star Didier Drogba". Global News. 27 July 2015. ^ Wiebe, Andrew. "Didier Drogba claims perfection and history with hat trick in first MLS start | MLS Now". Major League Soccer. Retrieved 8 September 2015. ^ "Match Report: Impact beats Toronto FC and finishes third in the East". Impact Montreal. 25 October 2015. Retrieved 26 October 2015. ^ "Dider Drogba scores as Montreal beat Toronto FC in MLS playoffs". Sky Sports. 30 October 2015. Retrieved 30 October 2015. ^ "Columbus Crew beat Montreal Impact thanks to Kei Kamara winner". ESPN FC. 8 November 2015. Retrieved 9 November 2015. ^ "Hiddink: I want Drogba back at Chelsea". FOX Sports Asia. 21 December 2015. Archived from the original on 27 October 2016. ^ McCarthy, Kyle (23 December 2015). "Montréal Impact to Didier Drogba: We want you to stay". FOX Sports. ^ McIntyre, Doug (25 January 2016). "Montreal Impact uncertain Didier Drogba will complete season in MLS". ESPN FC. ^ a b McIntyre, Doug (3 March 2016). "Didier Drogba won't play on turf for Montreal Impact to start MLS season". ESPN FC. ^ Beacon, Bill (24 January 2016). "Star striker Drogba confirms he will play for Impact in 2016". Montreal Gazette. ^ "MLS All-Stars 1–2 Arsenal: Didier Drogba scores but Gunners do enough". Sky Sports. 29 July 2016. Retrieved 29 July 2016. ^ McIntyre, Doug (16 October 2016). "Didier Drogba refused to play after exclusion from Impact XI – Biello". ESPN FC. ^ Carlisle, Jeff (26 October 2016). "Montreal Impact's Didier Drogba won't travel with team to face D.C. United". ESPN FC. ^ Rosenblatt, Ryan (27 October 2016). "Didier Drogba went to D.C. to see the Impact's playoff game despite rift with club". FOX Sports. ^ "Didier Drogba turns down huge offer by Corinthians which included his own armoured car". The Sun. Retrieved 12 April 2017. ^ "You've heard of player-managers, now Chelsea legend Didier Drogba is to be player-OWNER at American third-tier side". The Mirror. Retrieved 12 April 2017. ^ "Chelsea legend Didier Drogba becomes football's first player-owner after taking over US side Phoenix Rising". The Sun. Retrieved 12 April 2017. ^ Communications, Phoenix Rising FC (10 June 2017). "RECAP: Drogba Powers Phoenix Rising FC With Goal, Assist in 2–1 Win Over Whitecaps FC 2". Phoenix Rising FC | Arizona's Highest Level Professional Soccer Team. Retrieved 11 June 2017. ^ "Video: Didier Drogba scores super 94th free kick goal vs Orange County!". Witty Futty. 9 July 2017. Retrieved 9 July 2017. ^ a b "Didier Drogba smashes in ridiculous free-kick for Phoenix Rising". FourFourTwo. Retrieved 15 October 2018. ^ "Didier Drogba – A Great Servant, Moving On". Football Speak. 22 June 2012. Archived from the original on 29 June 2012. Retrieved 15 August 2014. ^ "Pharaohs are kings again". The Guardian. 10 February 2006. Retrieved 15 August 2014. ^ "World Cup finals draw in full". BBC Sport. 9 December 2005. Retrieved 15 August 2014. ^ "Argentina – Côte d'Ivoire". FIFA.com. 10 June 2006. Retrieved 15 August 2014. ^ "Côte d'Ivoire – Serbia and Montenegro". FIFA.com. 21 June 2006. Retrieved 15 August 2014. ^ "Elephants march past Benin". Sky Sports. 26 January 2008. Retrieved 15 August 2014. ^ "Côte d'Ivoire – Mali : les Eléphants éliminent les Aigles". Radio France Internationale (in French). 29 January 2008. Retrieved 15 August 2014. ^ "Elephants trample Guinea". Al Jazeera. 4 February 2008. Retrieved 15 August 2014. ^ "Ivory Coast 1–4 Egypt". The Guardian. 7 February 2008. Retrieved 15 August 2014. ^ "Match Report N° 31". Confederation of African Football. 9 February 2008. Archived from the original on 14 February 2008. Retrieved 15 August 2004. ^ "Ivory Coast 2–3 Algeria". ESPN. 24 January 2010. Archived from the original on 28 January 2010. Retrieved 13 March 2010. ^ "Algeria stun Côte d'Ivoire". sbs.com.au. 25 January 2010. Retrieved 5 July 2014. ^ "Drogba crowned Africa's Footballer of the Year". CNN. 12 March 2010. Retrieved 13 March 2010. ^ Doyle, Paul (4 June 2010). "Didier Drogba set to miss World Cup with fractured elbow". The Guardian. London. Retrieved 4 June 2010. ^ "Queiroz queries decision on Drogba cast". ESPN Soccernet. 15 June 2010. Retrieved 30 April 2016. ^ Fletcher, Paul (15 June 2010). "Ivory Coast 0–0 Portugal". BBC Sport. Retrieved 15 June 2010. 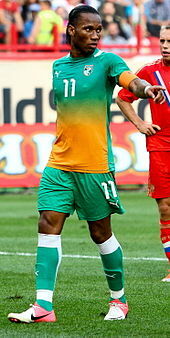 ^ "Drogba gives Africa hope of breakthrough". Retrieved 24 April 2016. ^ Lewis, Aimee (20 June 2010). "Brazil 3–1 Ivory Coast". BBC Sport. Retrieved 30 June 2010. ^ Lewis, Aimee (25 June 2010). "North Korea 0–3 Ivory Coast". BBC Sport. Retrieved 30 June 2010. ^ "Zambia 8 : 7 Cote d'Ivoire". cafonline.com. 2 December 2012. Archived from the original on 2 December 2013. Retrieved 9 April 2013. ^ "Ivory Coast World Cup 2014 squad". The Telegraph. 2 June 2014. Retrieved 20 June 2014. ^ "From euphoria to reality: Bosnia face questions before World Cup bow". The Guardian. 2 June 2014. Retrieved 20 June 2014. ^ "Ivory Coast 2–1 Japan". BBC Sport. 15 June 2014. Retrieved 20 June 2014. ^ "Didier Drogba". AskMen. Archived from the original on 14 July 2014. Retrieved 15 August 2014. ^ Burt, Jason (23 March 2008). "They decided to play the long ball and we could not cope". The Independent. London. Retrieved 27 March 2011. ^ a b c "Top 10 Greatest African Strikers". Johannesburg Post. Retrieved 23 August 2018. ^ "How does Chelsea legend Didier Drogba compare to the Premier League's finest strikers?". Daily Mirror. 18 March 2014. Retrieved 15 August 2014. ^ "Will Chelsea Ever Find Another Player Like Didier Drogba?". BSports. 23 May 2013. Archived from the original on 19 August 2014. Retrieved 15 August 2014. ^ a b c d e f g h i "The Record of Didier Drogba the Chelsea Legend". TheChels.co.uk. 23 May 2012. Archived from the original on 23 September 2016. Retrieved 16 August 2016. ^ a b "Where Didier Drogba Ranks Alongside Africa's 20 Best Strikers". Bleacher Report. Retrieved 23 August 2018. ^ "Chelsea striker Didier Drogba has edge over Real Madrid's Ronaldo in race to deliver the perfect free kick". Mail Online. 19 December 2009. Retrieved 15 August 2009. ^ "Let the Celebrations Commence: The Art of Soccer Celebrations". Bleacher Report. Retrieved 15 October 2018. ^ Koylu, Enis. "Drogba, Messi and Ronaldo the best I've faced – Pique". Goal. Retrieved 24 November 2017. ^ Walker, Joseph. "Puyol: Drogba was the toughest opponent I faced". UEFA. Retrieved 24 November 2017. ^ Perrin, Charles. "Man United ace Chris Smalling names Chelsea legend as toughest opponent". Express. Retrieved 24 November 2017. ^ Baiamonte, Joe. "Nemanja Vidic Names His Toughest Opponent". Sport Bible. Retrieved 24 November 2017. ^ Fernandez-Abascal, Eduardo. "Arsenal defender Laurent Koscielny hails Chelsea star Didier Drogba as 'toughest Premier League striker'". IBTimes. Retrieved 24 November 2017. ^ "Didier Drogba's 17-year-old son Isaac joins French Ligue 1 side Guingamp". BBC Sport. 19 February 2018. Retrieved 20 February 2018. ^ "Football: Togo ace gets a go". The Sunday Mirror. 9 July 2006. Retrieved 5 July 2014. ^ "Drogba Jr close to Le Mans deal". BBC Sport. 27 April 2007. Retrieved 23 October 2008. ^ "Vatican pays tribute to soccer star Didier Drogba". Catholic News Agency. 23 May 2012. Retrieved 15 August 2014. ^ "Didier Drogba biography". GFDB.com. Retrieved 15 August 2014. ^ "Football : " Pour moi, Drogba c'est d'abord mon cousin ". Info". vannes.maville.com. ^ "Best Feet Forward". Vanity Fair. Retrieved 20 July 2010. ^ Hayes, Alex (8 August 2007). "Didier Drogba brings peace to the Ivory Coast". The Daily Telegraph. London. Retrieved 30 April 2010. ^ "African soccer star becomes UNDP Goodwill Ambassador". United Nations Development Programme. 24 January 2007. Archived from the original on 28 September 2008. Retrieved 2 June 2008. ^ "Didier Drogba joins as a representative of an Ivory Coast panel". London: ESPN. 3 September 2011. Retrieved 11 September 2011. ^ Wilson, Jeremy (29 April 2010). "Didier Drogba named by Time as one of the world's 100 most influential people". The Daily Telegraph. London. Retrieved 30 April 2010. ^ a b "Chelsea's Didier Drogba donates £3 million to help build African hospital". The Daily Telegraph. London. 12 November 2009. Retrieved 11 June 2010. ^ a b "Drogba, Bono, Nike team up to support AIDS charity". Reuters. Retrieved 23 August 2018. ^ "Macron reçoit Weah à l'Elysée en présence de Drogba et Mbappé". Paris Match (in French). 2018. Retrieved 23 August 2018. ^ "Emmanuel Macron hosts meeting with Weah, Drogba and Mbappé". As. Retrieved 23 August 2018. ^ "Didier Drogba to join Ronaldo and Zidane in 12th annual Match Against Poverty". UNDP. Retrieved 25 August 2018. ^ Newman, Paul (2 October 2010). "Back to the banlieues: Drogba's journey home". The Independent. Retrieved 18 May 2014. ^ "Didier Drogba Profile". Footballdatabase.eu. Retrieved 3 February 2014. ^ "Didier Drogba". Chelsea F.C. Archived from the original on 6 January 2015. Retrieved 30 April 2016. ^ "Didier Drogba: Overview". Premier League. Retrieved 16 April 2018. ^ "Drogba celebrates latest triumph as Galatasaray win record-breaking 19th league title". Daily Mail. 5 May 2013. Retrieved 23 May 2013. ^ "ESKİŞEHİRSPOR GALATASARAY A.Ş. – Maç Detayları TFF" (in Turkish). Turkish Football Federation. 7 May 2014. Retrieved 30 April 2016. ^ "GALATASARAY A.Ş. FENERBAHÇE A.Ş. – Maç Detayları TFF" (in Turkish). Turkish Football Federation. 11 August 2013. Retrieved 30 April 2016. ^ "CAF names Best XI for Ghana 2008 ACN". cafonline.com. 10 February 2008. Retrieved 11 February 2008. ^ "Orange CAN 2012 Best XI". cafonline.com. 12 February 2012. Retrieved 12 February 2012. ^ "GLO-CAF Awards 2006". Confederation of African Football. Retrieved 16 August 2014. ^ "GLO-CAF Awards 2009". Confederation of African Football. Retrieved 16 August 2014. ^ "Alan Hardaker Trophy Winners". The Football League. 26 February 2012. Archived from the original on 21 April 2012. Retrieved 8 May 2012. ^ "European Footballer of the Year ("Ballon d'Or") 2006". RSSF. Archived from the original on 24 April 2017. Retrieved 3 April 2018. ^ "European Footballer of the Year ("Ballon d'Or") 2007". RSSF. Archived from the original on 1 February 2017. Retrieved 3 April 2018. ^ "European Footballer of the Year ("Ballon d'Or") 2009". RSSF. Archived from the original on 23 July 2017. Retrieved 3 April 2018. ^ "History of the BBC African Footballer of the Year award". BBC Sport. 11 November 2013. Retrieved 16 August 2014. ^ "Chelsea Player of the Year". GhanaWeb. 16 May 2007. Retrieved 21 August 2014. ^ "Chelsea FC Player of the Year 2010". Chelsea Football Club / YouTube. 7 May 2010. Retrieved 16 August 2014. ^ "Special ESM Squads". European Football Statistics. Retrieved 5 June 2012. ^ "Player by player". The Football Association. Archived from the original on 26 March 2006. Retrieved 30 May 2014. ^ "Didier Drogba wins FA Cup but Champions League is Chelsea's goal". The Guardian. 17 May 2010. Retrieved 16 August 2014. ^ "Ballon d'Or winners and the top 10 players from 2000 to 2017,". Talksport. 8 December 2017. Retrieved 3 April 2018. ^ "World Player of the Year – Winners". RSSSF. Archived from the original on 12 January 2016. Retrieved 3 April 2018. ^ "FIFPro World XI 2007". Archived from the original on 11 May 2013. ^ "Drogba honoured by Football Writers". Chelsea FC. 25 January 2015. Retrieved 27 January 2014. ^ "Didier Drogba (2013)". Golden Foot. 16 October 2013. Archived from the original on 10 July 2014. Retrieved 16 August 2014. ^ "Player of the year » Ivory Coast". Worldfootball.net. Retrieved 16 August 2014. ^ "Palmarès Trophées UNFP – Oscars du football – "Le plus beau but de Ligue 1" (vote du public)" (in French). Sport Palmares. Retrieved 16 August 2014. ^ "Palmarès Trophées UNFP – Oscars du football – Meilleur joueur de Ligue 1" (in French). Sport Palmares. Retrieved 16 August 2014. ^ "Palmarès Trophées UNFP – Oscars du football – Equipe-type de Ligue 1" (in French). Sport Palmares. Retrieved 16 August 2014. ^ "Montreal Impact striker Didier Drogba wins Etihad Airways Player of the Month award for September". Mlssoccer. 2 October 2015. Archived from the original on 1 December 2018. ^ "Didier Drogba wins MLS Player of the Month". Impact Montreal. 28 October 2015. Archived from the original on 1 January 2019. ^ ""Onze Mondial" Awards". Rec.Sport.Soccer Statistics Foundation. Retrieved 16 August 2014. ^ Hugman, Barry J., ed. (2007). The PFA Footballers' Who's Who 2007–08. Mainstream Publishing. p. 480. ISBN 978-1-84596-246-3. ^ "Rooney is PFA player of the year". BBC Sport. 25 April 2010. Retrieved 16 August 2014. ^ "2005/06 Season Review". Premier League. Retrieved 5 December 2018. ^ "The 2010 TIME 100". TIME. 29 April 2010. Retrieved 16 August 2014. ^ "Yılın sporcusu Arda Turan". Milliyet (in Turkish). 21 January 2014. Retrieved 16 August 2014. ^ "Iniesta, Messi, Ronaldo up for Best Player Award". UEFA. 14 August 2012. Retrieved 15 November 2015. ^ "Player Rater – Top Player – Didier Drogba". UEFA.com. Union of European Football Associations. Archived from the original on 22 May 2012. Retrieved 19 May 2012. ^ "Team of the year 2007". UEFA.com. Archived from the original on 9 July 2015. Retrieved 6 August 2015. ^ Chris Burton (15 September 2018). "Hazard hat-trick sees Chelsea star join legends in exclusive club". Goal. Archived from the original on 5 February 2019. Retrieved 5 February 2019. ^ "Miscellaneous facts – players". Chelsea FC. Archived from the original on 17 November 2017. Retrieved 5 February 2019. ^ a b "Didier Drogba: The ridiculous statistics". Football 365. 22 November 2018. Archived from the original on 5 February 2019. Retrieved 5 February 2019. ^ "Didier Drogba – Profile". UEFA.com. Retrieved 19 April 2015. ^ "Opta Joe". Twitter. 22 November 2018. Archived from the original on 5 February 2019. Retrieved 5 February 2019. ^ Mudeet Arora (18 September 2018). "9 Superstars Who Have Scored Hat-tricks for Multiple Clubs in the Champions League". 90 Min. Archived from the original on 5 February 2019. Retrieved 5 February 2019. ^ "Cote d'Ivoire: Drogba Retires From International Football". AllAfrica.com. 8 August 2014. Retrieved 16 August 2014. ^ Nosa Omoigui (22 November 2018). "Chelsea Legend Didier Drogba's 11 Biggest Career Highlights". 90 Min. Archived from the original on 29 November 2018. Retrieved 5 February 2019. ^ "Premier League Player Stats". Premier League. Retrieved 5 February 2019. ^ "Opta Joe". Twitter. Archived from the original on 5 February 2019. Retrieved 5 February 2019. ^ "Drogba the last of the MW1 hat-trick heroes". Premier League. 18 June 2018. Archived from the original on 18 June 2018. Retrieved 5 February 2019.